‘Phantom of the Floppera’: Grandfather of Music Apps? 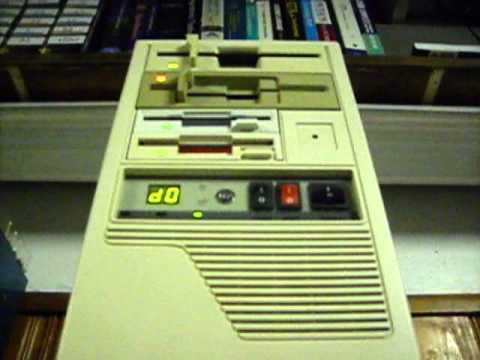 People have made floppy drives sing before, but this is my personal take on it. [The setup] features two 3 1/2″ drives and two 5 1/4″ drives connected to a PIC18f14k50 microcontroller. It interfaces to any MIDI source via MIDI over USB. Straight MIDI [i.e. from a keyboard] would also be possible with an additional small circuit and some minor firmware changes. This initial version can respond to all 128 MIDI notes, and pitch bends [of] plus or minus two semitones. As it can produce only four simultaneous notes [only four? really? ], and each drive has a different range and tonal characteristics, best results are obtained by arranging compositions by hand. In these times when we can access millions of songs with the tap of a touchscreen or even write our own by doing the same, it’s becoming harder to remember a time when the best sound you were ever going to get out of a computer was the hum of its floppy disk drive. Really, it wasn’t all that long ago.